In 1988, the Football League was an entity celebrated its century. In doing so, that esteemed body announced a series of events over the course of two seasons to commemorate and indeed celebrate this momentous landmark. Amongst the activities and events rolled out were a Centenary Tournament held over the course of a weekend in April 1988 and a fully-fledged eight-team tournament held on a knock-out basis in the opening months of the 1988-89 season. The former competition was held at Wembley and involved a total of sixteen teams drawn from all four divisions. The matches were 20 minutes each way for the first two rounds and 30 minutes each way for the semi-finals and final with penalty shoot-outs deployed in the event of a tie. The competition was won by Nottingham Forest who beat Sheffield Wednesday in the final on penalties after a goalless draw. It was perhaps a decent idea in theory but the reality was that it failed to grab the attention of the public and Wembley was largely empty for much of the weekend. With the exception of Crystal Palace, no London teams were involved, and for the main part fans of northern-based sides were not prepared to travel the length of the country in order to watch their sides for what may well be little more than half an hour’s football. The fact that nine of the 15 matches were decided by the spot probably did not help matters either. The second tournament held the following season was christened the Football League Centenary Trophy and was also known as the Mercantile Credit Centenary Trophy for sponsorship purposes. This competition was contested between the sides which had finished in the top eight in the 1987-88 First Division. Matches were poorly attended in the main and public interest was generally low. Ultimately, the final was played between Manchester United and Arsenal at Villa Park, and in a reasonably exciting match played before 22,182 spectators, Arsenal prevailed by two goals to one. 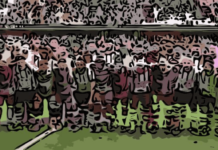 The fact that neither competition was a particular success in terms of interest or attendances was unfortunate and laid claim to the opinion that the Football League had taken the opportunity to commemorate a century of existence and promptly wasted it. The prolonged commemorations of the Football League’s first one hundred years culminated with a special challenge match played between league champions, Everton, and Bayern Munich. However, there was one other prestige event held that in comparison was a relative success. At the beginning of the celebrations, it was announced that Wembley was to host a special one-off game between the best of the Football League and all-comers on the world stage. The match was imaginatively labelled the Football League XI against Rest of the World XI and took place on August 8, 1987. The incumbent England manager at the time, Sir Bobby Robson, was chosen to manage the Football League team, while Barcelona’s manager, a certain Terrence Venables, was in charge of the World XI. Interest in the game was reasonable with 61,000 souls present in the old ground. This attendance would undoubtedly have been higher but for the decision taken to beam the game live on terrestrial television. The build-up to the game concentrated mainly on which players both managers would include in their squads. 1987 was a totally different beast in terms of the make-up of nationalities plying their trade in the top flight of English football compared to the current day, of course. This could be evidenced in the fact that the only non-British or Irish player included in Bobby Robson’s squad was Osvaldo Ardiles. Robson’s 17-man squad eventually consisted of nine Englishmen, three Scots, two from Northern Ireland, two from the Republic, and Ossie. Venables, for his part, in theory, had a larger pool to choose from but in practice was experiencing at least the same level of difficulty in arriving at a suitable squad. As all of his players were going to be travelling from overseas, certain assurances that they would get at least some game time had to be made before commitments would be confirmed. Venables, or the Football League on his behalf, tried for and failed to get the AC Milan duo of Marco Van Basten and Ruud Gullit to make the trip to London but were able to secure the services of the very recently retired Michel Platini. Having officially retired the previous June, Platini was persuaded to make one more (semi) competitive appearance and in doing so played his one and only match at Wembley. Gary Lineker was plying his trade under Venables at Barcelona at the time and so was a shoe-in for both the squad and starting 11. Also on display were future Liverpool title winner, Glenn Hysen, and reigning European Footballer of the Year, Igor Belanov, from the USSR. The star turn, however, was one Diego Armando Maradona. Coming barely a year after the infamous ‘Hand of God’ match at Mexico ’86, he was a controversial inclusion as emotions were still running high and it was supposed that reactions from the paying crowd would be mixed at best. Pleas made prior to the kick-off to respect Maradona rather than boo him were never likely to do anything other than fall on deaf ears, though. On a rather dreary North London afternoon a reasonably decent-sized crowd turned up to be entertained by not only the match itself but also by the pre-game razzamatazz. 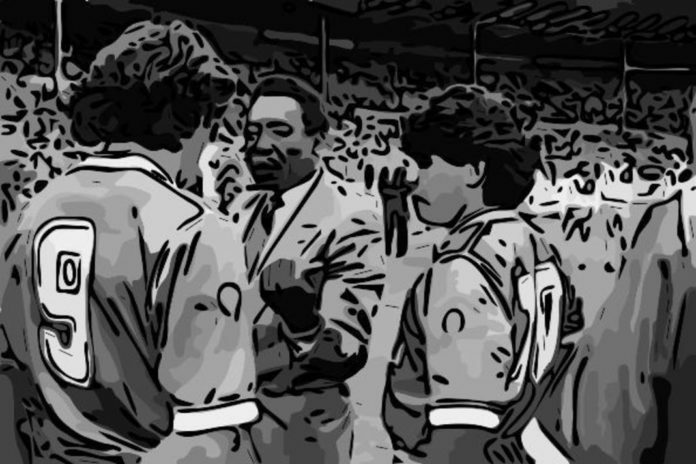 This included the teams being presented to the legendary Pele, as well as each player being individually introduced to the crowd after making a toe-curling individual march from the tunnel. Football League XI: Shilton, Sansom, Gough, McGrath, Robson, Waddle, Webb, Beardsley, Brady, Clive Allen, and John McClelland of Watford and Northern Ireland. The Rest of The World XI: Rinat Dasayev, Glenn Hysen, Thomas Berthold, Salvatore Bagni, Julio Alberto, Diego Maradona, Celso, Paulo Futre, Josimar, Gary Lineker, and Michel Platini. The atmosphere was a fairly relaxed one both on the pitch and the terraces, with the majority of support naturally in favour of the Football League XI. In the main, the crowd was appreciative of the skill on display in front of it even if the levels of commitment amongst the protagonists tended to differ significantly. Platini made the most of his long-delayed sole Wembley appearance and glided across the pitch showing the silky skills that had made him one of the top players in the world over the previous decade and a half. Spraying the ball around with ease and clearly enjoying himself, 15 years of memories since his debut for Nantes in 1972 must have been going through his mind. As for Diego, well, he was probably enjoying himself, too. 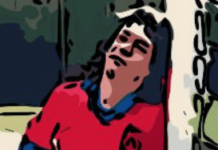 Unwilling to commit to appearing until £100,000 had been safely deposited in his bank account, Maradona spent large chunks of the afternoon doing little more than apparently going through the motions. Just occasionally, however, he roused himself sufficiently to allow the merest glimpse of what a magnificent player he truly was. Fears that he would be abused were pretty much realized as his every touch was booed, but it was more in a pantomime manner than a truly derogatory one and certainly didn’t seem to bother the man himself. Bryan Robson was on good form for the hosts and seemed to be taking the match seriously enough with an inspiring performance. 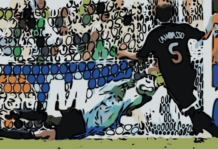 A couple of times he seemed to actively ‘go looking’ for Maradona before pulling out of fully fledged tackles at the last second and contenting himself with nudging the Argentinian off-balance instead. A single Robson goal divided the teams at half-time before the first rash of substitutions was made. Arriving in place of Clive Allen, Robson’s Manchester United teammate, Norman Whiteside added a second goal early in the second half before Robson completed the scoring late on. Amongst the second-half substitutes was Coventry City goalkeeper, Steve Ogrizovic, who was making his second Wembley appearance in eight days having appeared in the Charity Shield against Everton a week earlier. That match had been played in front of 27,000 more paying customers and had also been televised live. Following the game, certain sections of the media questioned both the value of the match in general and the worth of the Football League’s victory in particular. These supposed slights irked Bobby Robson somewhat as he had expressed delight in his team’s performance and the result. “I don’t believe it. If we had been beaten 3-0 the knives would have been out. Because we have won no one seems the slightest bit interested.” was his rather grumpy riposte to critics. Perhaps due to the criticisms of the Football League regarding its protracted fourteen months or so of self-celebration, the day when three of the all-time greats of world football came together to appear on the same stage at the same time has been largely forgotten. That is a bit of a pity.